It takes a lot to make a job search successful. With how many candidates you will be competing with for every opening, you need to have a way of standing out. Your tool for accomplishing this is your resume. This document allows you to demonstrate your skills and abilities, although there are also exact requirements and expectations that you need to meet. Reviewing resume templates helps you to create a resume that appeals to employers. Employers are looking for the best candidate who will make a big difference in their company. They want someone who has a history of working hard and succeeding in similar positions. It is your job to show that you are that candidate. Fill-in resume templates direct your writing so you can create the best document possible. Why Use Fill-In Resume Templates? When applying for an internship, you still need a resume, but there are different expectations and limitations. If you write your internship resume exactly like a normal job resume, you are significantly hurting your chances of employers calling you back for an interview. You need to use a resume template that is specific to internship opportunities to guide your writing. Do not forget that all resumes have strict length limitations. Under most circumstances, a resume should fill an entire page but not bleed onto a second page. It is only acceptable to use a second page when you have more than 10 years of working experience. 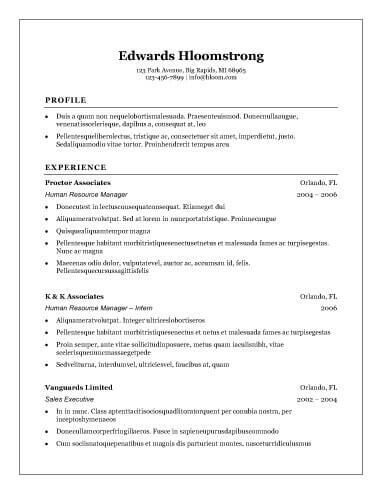 Learn more about the resume length rules by reviewing one-page fill-in resume templates. One of the most unique types of resumes is the entry-level resume. This one is different because it is for applicants who have no or little previous working experience. If you are getting into a field for the first time, you need to understand how to show your qualifications without relying on your experience section. Entry-level fill-in resume templates show you exactly how to do this. All resumes need to effectively demonstrate professionalism above all other qualities. After all, you are applying for a professional position. You need to make an intentional effort to make your resume seem as professional as possible. Taking a look at professional resume templates can help you understand some of the most effective writing techniques for emphasizing your professional qualities specifically. In the modern world of recruitment, hiring managers often use a computer to screen resumes before taking a look themselves at only the ones with the most potential. Do not let a computer screen out your resume before a human even sees it. Modern fill-in resume templates ensure you create a resume that a computer can read properly. When you are writing your resume, it is vital that you focus on the content most of all. How you say it is important, but what you say is what determines whether the employer calls you in for an interview. Fill-in resume templates can help inspire you for this aspect. Include your full name, phone number, email address, and mailing address. It is okay to only write your city and state instead of a full mailing address. Make sure the email address you use is professional looking. The purpose of the summary is to catch readers’ attention and guide them to the skills section. Include three sentences or bullet points that briefly explain your skills, qualifications, and work history. It should sum up all the information in the rest of your resume. Do not include objective information in this section. This section should be one of the lightest in your resume. Four to eight bullet points are all you need. It should be possible to understand this section thoroughly after only a few seconds of skimming. Only include skills that are directly relevant to the specific position you are applying for. List your previous jobs in reverse chronological order. Begin with the most recent and go backward. Include five to eight bullet points for each position that describe your responsibilities. You can include more or fewer depending on how important the position is. Current positions should be in present tense and previous jobs should be in past tense. The first word of every bullet point should always be a strong action verb. Choose one that reflects actions you took while working that job. Write your school, date of graduation, and degree type. You can write your expected date of graduation if you are still in school. Generally, you should not mention your grades or GPA. Some employers will request this specifically. Although getting started on a resume can seem daunting at first, the right templates and a resume builder make the process easier. You just fill in the information and select the document format for the job you are applying to, and the builder tool generates the resume for you. Start on your document today.